Norland Cromwell 2 Log Cabin: The Norland Cromwell 2 Log Cabin feature a flat roof style finish but actually has a shallow pitch to ensure that water runs towards the back of the cabin. The flat roof style allows the walls to be higher yet the maximum height still complies with the planning rule of max height 2.5 where applicable. The building uses Premium Plus Quality Double Glazing and a 70mm wall log. This creates a very effective sound as well as heat barrier for a quiet sense of seclusion which is an ideal working or as a superb quality leisure building. The Norland range is renowned for the quality of the spruce that goes into the manufacture of the cabins and this building especially, with its superb quality double glazing, is a perfect retreat! 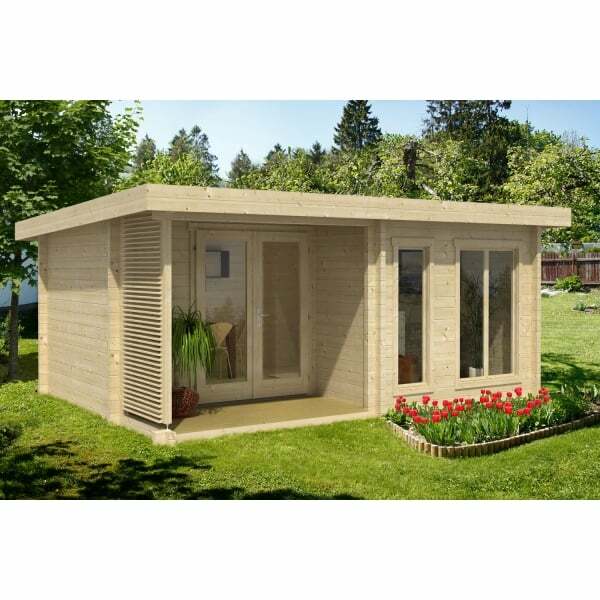 The Norland Cromwell Log Cabins are easy to assemble and are an extremely sturdy structure as they are built in the traditional Log Cabin style and therefore uses no screws or nails in the wall construction. The Norland range also feature chalet corner jointing to give that extra timber jointing for extremely good weather resistance.